Fancying an Aussie whisky I originally had my heart set on something from the Lark Distillery. However, the good folk from Oak Barrel in Sydney did such a good job of selling Sullivans Cove that I decided to get a bottle of their Port Maturation, Cask Strength, Single Cask whisky. It's worth unpacking the whisky's name. The whisky is aged in French port barrels from which it derives it's main flavour notes. The whisky is also cask strength, punching in at a hefty 60%. Finally, the whisky is single cask, with each whisky coming from a single barrel. I was a fan of the styling of the squat little bottle. There is a hand written label on the side detailing which barrel the whisky has come from and what number bottle it is. It's also the first whisky I've come across to have a screw top. Where Australia's wine producers have led the way with screw tops it appears that Tasmanian whisky producers are trying to do the same. Will Islay be converting any time soon? Nose: Being a cask strength I was expecting a lot of alcohol on the nose, but it was deceptively light. The flavours I noted down were: pepper / spicy, dried fruit, sultanas, raisins, nutty, port-mustiness and fruit & nut chocolate. Not a lot of complexity. Palate: There might not have been a lot of alcohol on the nose but it certainly hits you here! I couldn't drink the whisky without cutting it with quite a lot of water. My flavour notes include: easy drinking, smooth / creamy, dried fruit, port flavours and tastes like the nose. A slightly oily mouth feel. The flavour doesn't transform and evolve in the mouth like you get with more complex whiskies. We yearned for some dark chocolate to drink the whisky with and it was lucky I had some! The Sullivans Cove went down well with everyone who tasted it. I think we were all pleasantly surprised that such a young distillery can produce a high quality whisky. It surprised on the upside, especially considering that it is only add age. Although it is on the expensive side at A$160 a bottle. I had a final dram of the Sullivans Cove at the end of the night having drunk some peaty monsters (e.g. Laphroig Quarter Cask) in between. I thought the whisky would have been over powered, but it still tasted as good as the first nip. 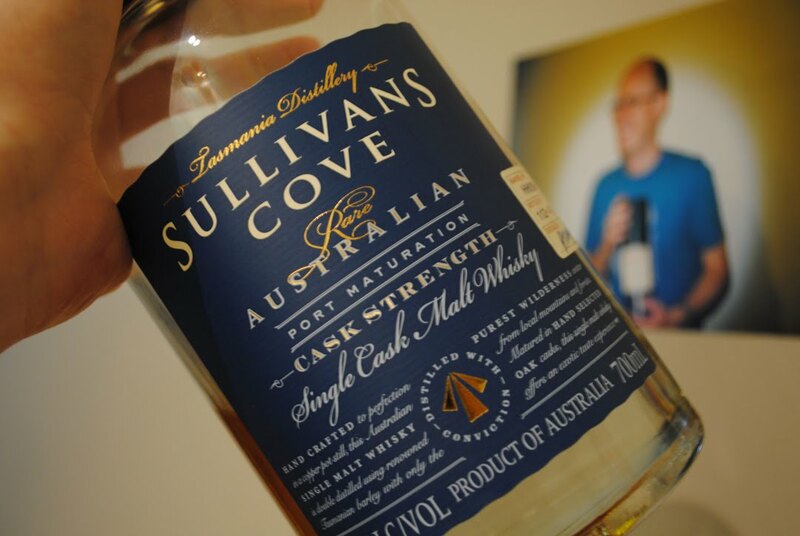 Also in the Sullivans Cove range are a Bourbon Maturation, Cask Strength, Single Cask (A$160) and a blend of the Port and Bourbon maturation's (A$100). I'd like to try the blend next to see if there is some extra complexity there. Definitely a distillery to keep an eye on to see how it develops.